Just a few little thing’s I’ve learnt that I don’t mind sharing. You may be able to relate to one or two. But if you’re serious about becoming a cake decorator, you should definitely read these 10 ten top tips first! 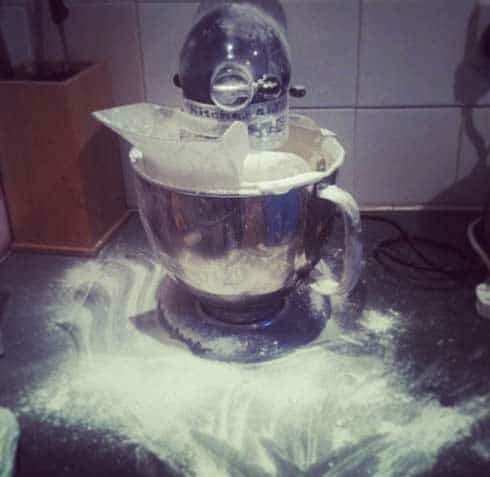 I’ve seen a few of these posts doing the rounds online and thought I’d write my own version of how I’ve found becoming a cake decorator has literally changed my life… my house.. my appearance…like I said – my life! I’m not an official trained baker, I’m a self-taught, hands on, learn as I go type of baker. So as time went on I realised just how naive I’d been! Will turn into your cake room. It will be known by your family members as the cake room. Everything will have a coat of icing sugar on it, and you will find buttercream in places you didn’t know buttercream could get into to! Your cupboards will be overtaken by tins, ingredients and sprinkles. You will run out of dishcloths and tea-towels – I swear I must buy these non stop and they always disappear, the sock monsters naughty twin maybe? Hobbycraft will be your new favourite shop because they have the best storage solution ideas. All this cake stuff costs a lot of money and you’ll be wondering why you didn’t go into supplies yourself! Oh and its expensive because you need it all! Yes, every cutter, every colour gel, every new item you see on your Facebook newsfeed! Unless you are good at restraining yourself, unlike me. Your bank account balance may suffer. You wont be able to go anywhere without seeing ‘cakespiration’ whether it’s just to the corner shop, the park, the supermarket, school, even in a bar drinking a cocktail. Everything is cake! Ahh look at that pretty flower a normal person would say. A cake decorator thinks “oooh that would look pretty hand painted on that cake in August” or “oooh I could make that out of gumpaste no problem”. No matter how many rules you set about not staying up past 11pm to finish decorating a cake you will be up until 2am, possible 3am! Every Friday night… you may even fall asleep at the table (Once, it only happened to me once!). When everyone else that you know is saying “Thank god its Friday” you don’t get that feeling until Sunday! You will develop a diet coke addiction and your boyfriend/husband/partner will have to put you on rations! Or is that just me? Wilton Light Blue food gel does stain your skin.. this includes your forehead and your cheek and takes about 3 days to wash off. (Can you tell I’ve experienced this?) Latex gloves are the answer to this. Your dishwasher will become your new best friend. You will always be on the hunt for the best fondant, the one that doesn’t crack, the one that kneads well, the PERFECT fondant. You will try all the brands out there and then when you find your favourite order in bulk as they’ll most likely go out of stock when you need it most! Unless you can resist eating the cutoffs, the spare cupcakes, the delicious fillings then you’ll either need to find some more time to exercise or you will gain at least a stone in weight.. that’s normal! Oh and carrot cake isn’t healthy just because it has some veg in! Its still full of butter. Yes, I’ve told myself a few times I’m allowed to eat the cut-offs for this reason… guilty! Finally, if you agree with what I’ve said then you’ll most likely also agree with me that the best part, the part that really does change your life is when you deliver a cake and the customer falls in love with it! They send you a million messages saying thank you, they don’t want to cut it because its just too pretty. That part is the most rewarding. This post was just a little bit of fun (based on my experiences) and I do of course love cake decorating or I wouldn’t be in my 3rd year now. Hope you enjoy this post and feel free to share any of your ‘life changing’ moments. Much the same for me… Just substitute ‘cake tins’ for ‘camera lenses’ or camera kit in general!